A sound understanding of Logarithmic Differentiation is essential to ensure exam success. Logarithmic differentiation is the process of first taking the natural logarithm (log to the base e) and then differentiating. 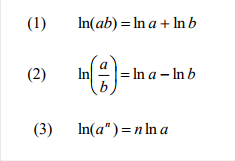 The function should be simplified before differentiating. Through step-by-step worked solutions to exam questions available in the Online Study Pack we cover everything you need to know about Logarithmic Differentiation to pass your final exam.